I'm attempting to calculate vegetation indices in ENVI 5.2 using level-2 AVIRIS data in band math. The indices I'm working with are Vogelmann Red Edge 2, normalized difference red edge, and red edge NDVI (reNDVI). All these indices have the same format as for NDVI. These indices are supposed to all be in the range of -1 to 1, however they are typically outside of the -1 to 1 range. For example, I tested this band math equation for NDVI and got a range of -1.163 to 0.946. I've tried other iterations of the band math equation (e.g., altering which variables are designated "float"), but they also produce indices that are outside of the valid range. Re-doing the indices in ENVI, most values are in the proper range. The table below is for reNDVI using (float(b1)-float(b2))/(float(b1)+float(b2)). 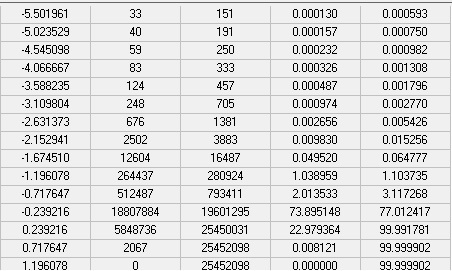 The second column, "count" indicates there are almost 19 million pixels with a value near -0.24, with another 10 million pixels in the two bins next to it. However, a couple hundred pixels are still out of range. I'm not sure why I get this. Does this make the whole band invalid (for the index), or are these really low values to be expected from things like bad pixels? after atmospheric correction and rescaling, compute your indices. Not the answer you're looking for? Browse other questions tagged remote-sensing raster-calculator envi vegetation-index hyperspectral-sensor or ask your own question. How do you digitize an ROI in envi 5.2? ENVI seamless mosaic incorrectly altering data?